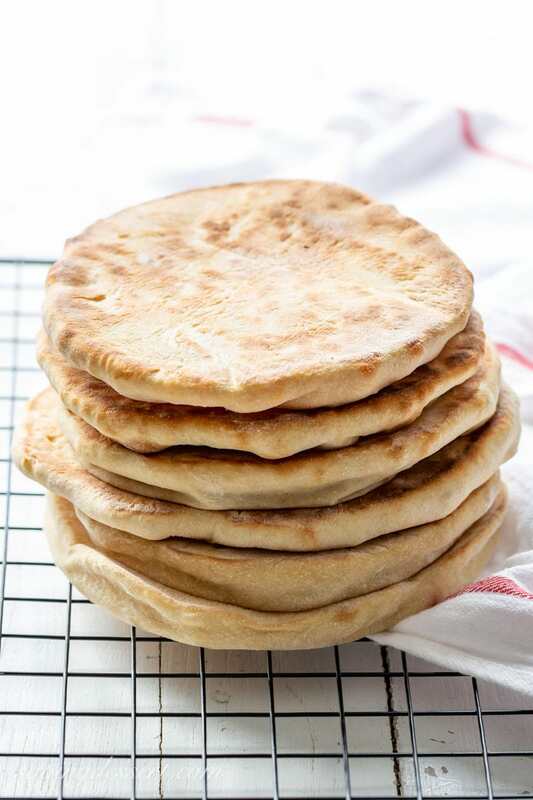 Try this easy homemade whole wheat pita recipe next time you crave tender, chewy pitas with a touch of honey for sweetness. The first time I made a pita recipe, I learned a lot! I found out that pitas are one of the easiest yeast breads you can make at home, and they taste tremendously better than store-bought. That first attempt at making a pita recipe didn’t yield beautiful puffed up pockets, but they were incredibly flavorful flatbreads! Even if they’re not perfect every time, you can still enjoy these toasty, soft, chewy wonders. So if you’re a first time baker, or have been yeastaphobic your whole life, let’s change that right now! This pita recipe comes together in minutes right in your stand mixer. Once the dough forms a satiny, sticky ball, all that’s left is to divide it into eight equal pieces and let them rise in the refrigerator overnight. The next day the dough balls are rolled into a circle and baked. Pretty easy right? After years of baking and enjoying various pita recipes, I found the one single key to perfect puffiness. There is one simple rule that must be followed when making a pita recipe. Once the dough has been formed into individual balls, you never, ever, ever want to fold, crease, flip or heavily manipulate the dough in any way. After the overnight rise, handle the dough ball with care. Press each dough ball with the heal of your hand to shape into a disk, then use a rolling pin to gently roll it out into a 7-inch round. When transferring the pita to the oven make sure the top is still the top. You can flip the pita over after the bottom side has baked and the pita puffed. Folding, creasing, smashing, cutting, reshaping and being heavy handed with the dough will impede pocket perfection. Again this is not the end of the world, you’ll just have delicious flat breads to enjoy but with no pocket. There’s always one or two that don’t come out perfect. Don’t worry about it! We bake our pita recipe in a hot oven on a preheated stone. If you don’t have a baking stone, no worries, you can use a cast iron skillet or baking sheet. Whatever you use, make sure your oven and baking pan are fully pre-heated. In theory, these pitas also bake well on a hot cast iron skillet on the stove top. The skillet method is perfect for camping or whenever you don’t have an oven handy. But, try baking them in the oven first. The pitas bake all the way around instead of just browning on the bottom. 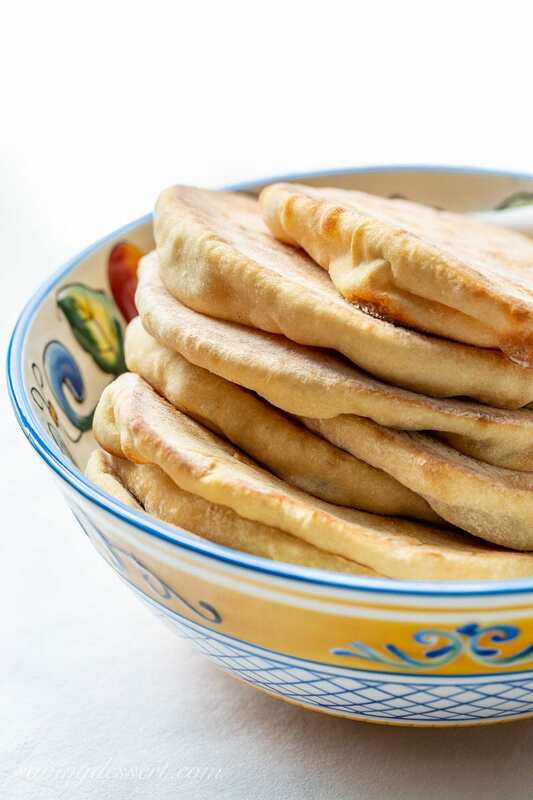 What can you do with all these fresh, hot delicious pita breads? Just about anything! One of our favorite ways to enjoy leftover pita bread is to make easy baked pita chips. 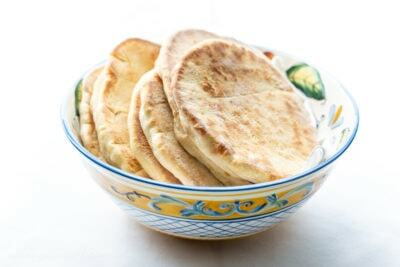 Brushed with a mixture of olive oil and our favorite seasonings, the pita wedges are baked until golden brown and crisp. These are terrific for dips and we especially love them smeared with hummus. Try seasoning pita wedges with oregano, sea salt, fresh ground black pepper and granulated garlic for an easy, healthier chip alternative. Pitas also make great sandwiches, pizzas and scoops for everything else on your plate. Pitas are practically a freak of nature. I love how these little pieces of dough puff up into hollow pockets ready to be stuffed, split, toasted, topped and dipped! The possibilities are endless. Pita recipes have been around for more than 4,000 years and are a staple in many Middle East and Mediterranean countries. 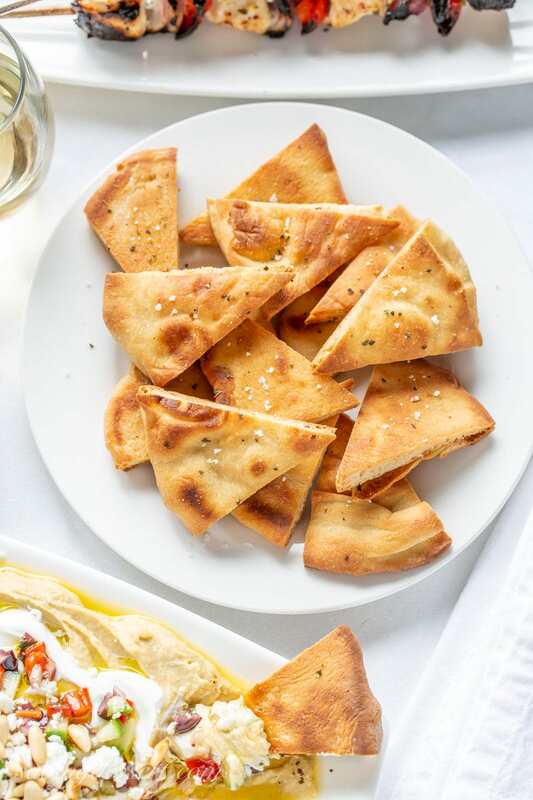 Make this pita recipe part of a fun Greek themed dinner party. 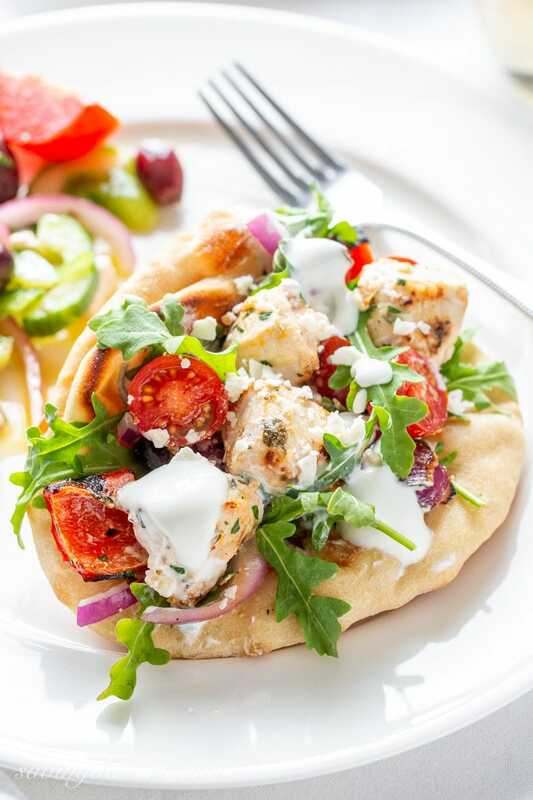 Enjoy these fluffy pitas with our deliciously flavored Grilled Greek Chicken Recipe. Our chicken marinade works great with boneless, skinless chicken pieces, skewers / kabobs and even Oven Roasted Chicken Breasts. 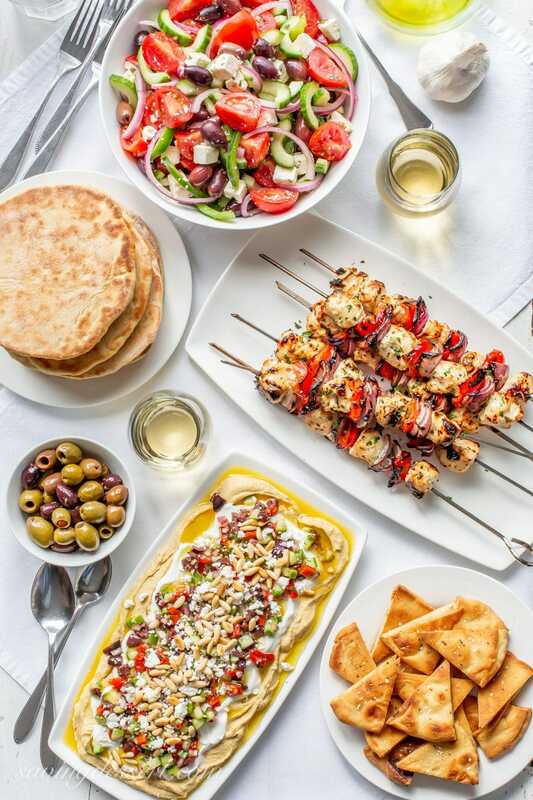 These pita breads and Greek marinated chicken kabobs are perfect served along side an easy and delicious Greek Layered Dip and a nice crisp Greek Salad too. Enjoy! We have multiple stone pans in our kitchen with many purchased through Pampered Chef home parties. If you don’t know a dealer, you can pick up a baking stone from any kitchen supply store, or, of course, Amazon. You’ll find many uses for stone pans far beyond pizza and bread. This ultimate Pizza Stone is approved for the oven and grill. The 16″ round baking stone has exclusive ThermaShock Protection & Core Convection Technology for perfect crispy crusts on pizzas & bread. The no-spill stopper is a nice feature that prevents your pizza from sliding off while being removed from the oven. Click on the photo for more information. 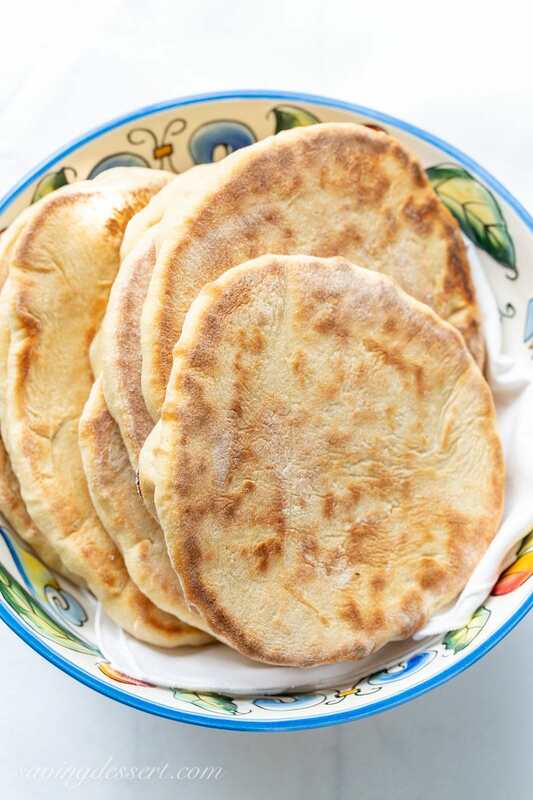 Enjoy these tender, chewy pitas with great flavor and a touch of sweetness from the honey. The dough must be made the day before baking, so plan ahead! In the bowl of a stand mixer whisk together the flours and yeast. Add the water, olive oil, and honey to the bowl. Fit the mixer with the dough hook and mix on low until all the flour is incorporated. Set aside for 10 minutes. Sprinkle the salt across the dough and mix on medium speed until the dough forms a smooth, sticky ball that clears the sides of the bowl,. This should take about 8 to 10 minutes. If after 8 minutes the dough is still shaggy, add bread flour, one tablespoon at a time, using up to 2 tablespoons additional flour. Lightly coat a rimmed baking sheet with vegetable cooking spray. Set aside. Working with one dough ball at a time, form each into a tight, smooth ball by bringing the edges of the dough together into the center and pinching the seams together to seal. Place the dough balls, seam side down on the prepared baking sheet about 2-inches apart. Repeat until all 8 dough balls are formed. Lightly spray the tops of each dough ball with vegetable spray, then cover tightly with plastic wrap. Refrigerate for at least 16 hours and up to 24 hours. One hour before baking, adjust the oven rack to the lowest position and set the baking stone on the rack. Preheat oven to 425F. Remove the dough from the refrigerator. Place one dough ball on a heavily-floured counter, seam side down. Leave the remaining dough balls covered with plastic wrap. Lightly dust the top of the ball with flour then gently press the dough ball into a 5-inch circle using the heel of your hand. Using a rolling pin, gently roll the disk into a 7-inch circle taking care not to crease, fold or bend the dough. Repeat with a second dough ball. Carefully transfer the disks to a rimless baking sheet or peel, knocking off the excess flour. Make sure the side that was facing up when you began rolling, is still facing up. Slide both the dough rounds onto the hot stone and bake until evenly inflated and lightly browned on the bottom, about 3 minutes. Using a large spatula, turn the pitas and continue cooking until puffed and lightly browned in the center of the second side, about 2-3 minutes. If the pitas do not puff up, turn and bake anyway to prevent burning. Transfer the pitas to a wire rack to cool. Cover lightly with a clean dish towel. Repeat with remaining dough balls. Store leftover pitas at room temperature in an airtight container. To reheat, wrap the pitas in foil and heat in a 300F oven for about 15 minutes. Pitas are best eaten the day they are made. PRO TIP: Shaping the dough into smooth, taut balls and rolling the proofed balls into even disks are the keys to pitas that reliably puff in the oven. To make pita chips: Preheat oven to 400F. Line a baking sheet with parchment paper. Cut the pita into 8-wedges. In a small bowl combine olive oil, dried oregano, fresh ground black pepper, and a pinch of granulated garlic. Brush the mixture on the tops and bottoms of the wedges and place on the prepared baking sheet. Sprinkle lightly with sea salt, if desired. Bake until lightly browned, turn and continue baking until both sides are browned. Method adapted from Cook’s Illustrated. Check out some of our other favorite Greek-inspired recipes. 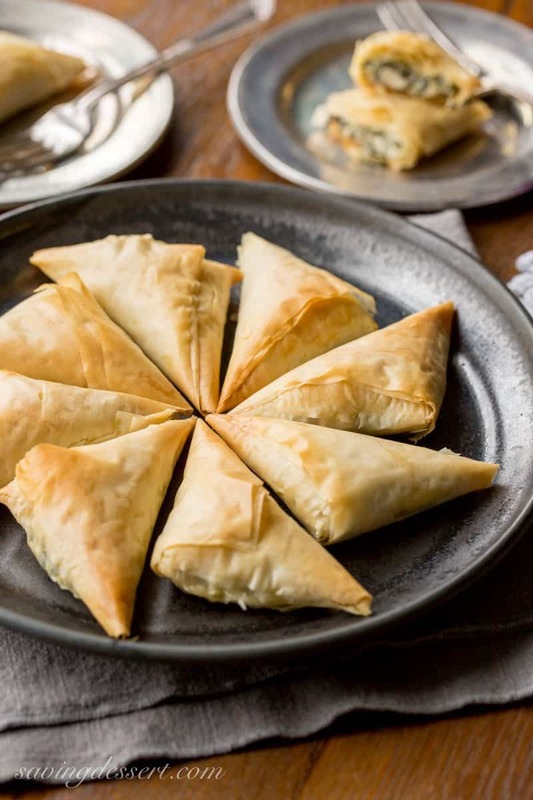 Try our Honey Baklava Recipe with layers and layers of flaky phyllo slathered with melted butter, honey and loads of nuts. This recipe is easily halved and can be made several days in advance. 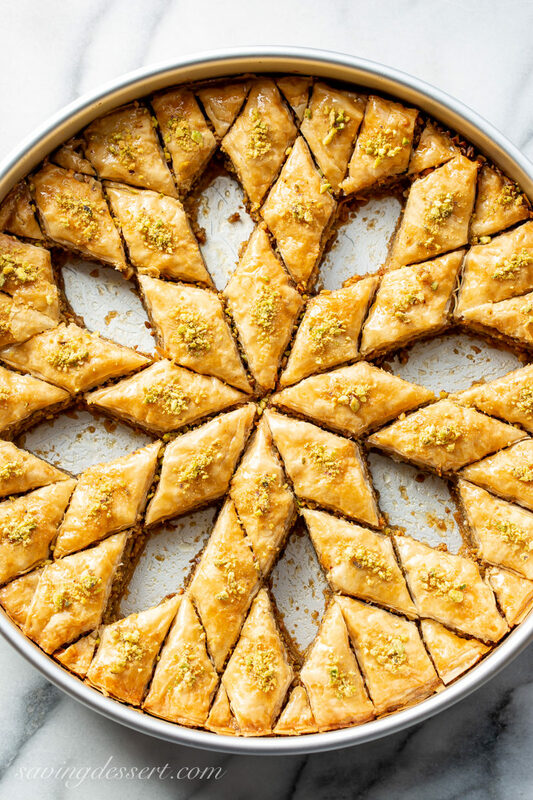 Who can resist a slice of this delicious Honey Baklava?! Click HERE to get the recipe for Honey Baklava. If you’re looking for tender, juicy and flavorful all in one delicious bite, you’ll LOVE this Grilled Greek Chicken Recipe! 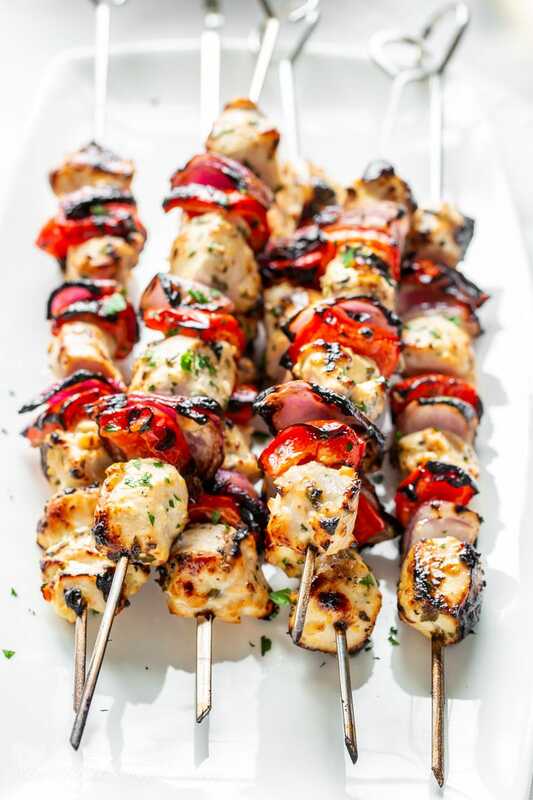 Click HERE to get the recipe for these easy Grilled Greek Chicken Kabobs. What a feast!!!! Every single dish looks amazing. The pita I can buy around here is awful, so I’m going to have to make yours next time I get a craving (which is now!). They turned out so perfect, Tricia. Your whole wheat version turned out beautifully. I posted my version from the same recipe source, and I admit that they were so much fun to make. I’m going to try the whole wheat version next. As always, your photos are stunning and so inviting! Thank you so much! These are delicious – hope you give them a try. I hope I’m invited to that Greek dinner party ~ and I love your whole grain take on pita. Great post Tricia! Now that I’ve finally mastered the art of homemade humus, homemade pita sounds like the perfect next step. I like your recipe, especially because it uses whole wheat flour, definitely giving it a try. Yes! You’re going to love these Amalia. Homemade hummus is the best. Thanks for stopping by! I love Pita bread, but never made my own.<br />Your recipe looks so good and easy to do so I'll try it! Thank you for coming back Tanna – I messed up my blog – you know how it is, click a box here, click a box there – shame shame! I do have leftovers – we froze 2/3 of the recipe and am making BBQ chicken pita pizzas for dinner tonight with left over grilled chicken. Have a great weekend! I am amazed at the very idea of making your own pita bread. Looks like they came out great! What a feat! Give them a try Monica – so delicious and easy. Have a nice weekend! I haven't made pita in a while, but as I recall, it was one yeast bread that even I didn't mess up (and I have a lousy track record with yeast breads)! It looks like you perfected the puffy pita art quickly! We love a tapa style dinner – bread, cheese, olive oil, olives, dips yum! I love naan too – I think I love bread – but mostly these flat breads and pizza, I do love pizza! We've been out of town for a little while and am trying to catch up with everyone! I've only made pitas once and now I'm wondering why I don't make them more often. Saving your recipe for next time. Tricia, Love, love, love your blog! And the photos are amazing! <br />I have found that spraying water (from a spray bottle) on top of the pitas just before they go in the oven makes them dome perfectly. Wendi – thank you so much for this suggestion. I will try spritzing water on top before baking – thank you – thank you – thank you! !